At the end of the summer we helped out a friend whose mother was going into a respite facility for a few months. We decided to foster her eleven-year-old canary. How demanding, we thought, could that be? It turns out…Tweet is a wonderful house guest both smart and curious. I’d lived with a budgie for a few years in my twenties and thought I had a good grasp of bird care…fill the seeds and water, change the paper, add gravel, cover at night. Well…I was wrong on so many levels. Thankfully, there’s the Internet to help bring us up to speed! I messed-up with bedtime, too. Our budgies always sat up with us in the evenings. We’d bring their cages into the living room or provide a perch for them to fly to. (Unless they preferred sitting on our head or shoulder.) We thought Tweet might be a little homesick, so we did the same for him…and he started to molt off-season. Canaries wake up with the sun and need a tuck-in time close to sundown. Which means they stay up longer in the summer…and that’s their usual molting season. I also learned not to put gravel on the floor or use sandpaper covers on the perches…all new information since the days I lived with a bird before. 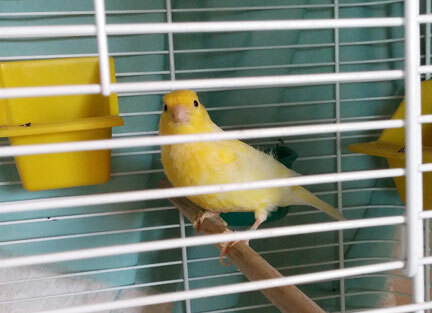 I found a wonderful website called www.robirda.com that is THE go-to place for canary owners, I’ve since learned. What a wonderful help she has been. Tweet has become as much a member of the household now as any beloved dog we’ve grown to love. He has his crazy ways of singing (more like a rendition of jungle birds than a sweet canary song)…and his shy ways of not eating or singing if we watch…but curious fellow that he is, he always comes right over to see us when we stop by. Should the day ever come that we have to give him up, we’ll be more than sad to lose our friend. Hopefully, he’s found his forever home with us.